The Smart City development has been a popular issue in the recent years. The core idea of a Smart City is to design a city that fulfills its citizens’ desire to gather quick and meaningful answers to their questions. SuperGIS 3D Earth Server can help you to design such a platform to not only provide citizens rich information but also visualize the information for better understanding. 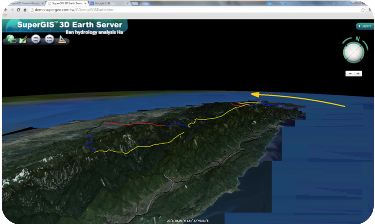 It is an enterprise level 3D server product which can help users to share GIS data in 3D space through the Cloud technology and solve 3D spatial problems. The goal of this Smart City platform is to improve the process of decision making. 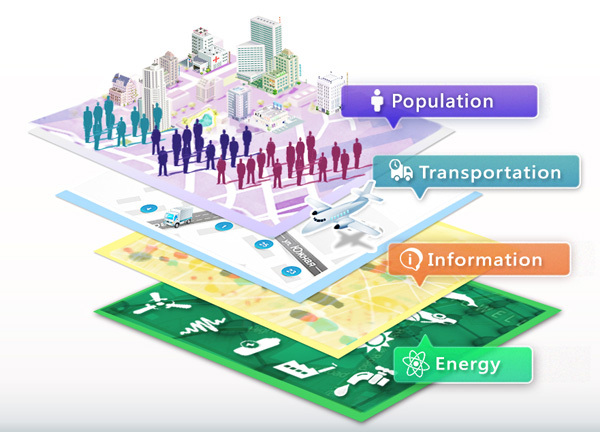 By publishing different information layers to SuperGIS 3D Earth Server, citizens can easily know answers to the questions like ‘Is the nearest metro station above ground or underground, and how to get there?’ by accessing to the published resources, and make better decisions than before. In addition, city developers can display their future development projects on the platform and analyze the profits, impacts, and the costs of different projects. The 3D visualization power of SuperGIS 3D Earth Server can help developers understand the spatial relationships among different projects and thus helping assess the feasibility. To build such a platform with SuperGIS 3D Earth Server 3.2, users can first prepare and design their map layers in SuperGIS Desktop or SuperGIS Map Designer. Then use an add-on called “3D Earth Administrator” to publish all the map layers to SuperGIS 3D Earth Server as a re-usable globe service, which can be accessed by different client-side applications. The process is illustrated in the figure below. Let’s give you a story as an example. There is a typhoon coming, which is predicted to affect the country. Then the authorities can use SuperGIS 3D Earth Server to publish satellite images as a base map, a DEM model to show the terrain, and also the predicted path of the typhoon and its predicted impact areas. After publishing the information, citizens can go to the official website and see where the predicted impact areas are and avoid dangers. The advantage of displaying the information in 3D space is that people can easily understand how the natural disaster interacts with the environment, as shown in the figure below. The yellow arrow indicates the predicted path of the typhoon, which brings strong winds and heavy rains. The typhoon rotates counterclockwise in the northern hemisphere. Therefore, the mountain areas in the West side, which is the windward side, are seriously affected by the typhoon. And the areas in the East side, which is the leeward side, are barely affected. You can link to the hyperlink below to see our demo site and interact with the GIS data in 3D space. 1. Easily publish and share GIS data as a globe service via Cloud technology. 2. Understand the map in 3D visualizations. 3. Centrally manage GIS data in a geo-database. 4. Interact with the GIS data in 3D space through various applications, including web browsers. 5. Solve 3D spatial problems. In the near future, SuperGIS 3D Earth Server can not only display all your GIS data in 3D space, but also support the powerful GIS analyses. With this technology, users will be able to solve 3D problems and share the solutions to others on the fly. For example, users can analyze terrain data to determine what can be seen from observation points, or solve routing problems in 3D space to understand how to take advantages of the bridges or underground tunnels to save time. This will be a breakthrough technology in tradition GIS and will surely bring us a better tomorrow.